The town of Žabljak, which is situated at the foot of the Durmitor mountain range, is located in the North-Eastern Montenegro, close to the Bosnian and Serbian borders. It’s 125km North-West of the capital of Montenegro, Podgorica. You can arrive in Montenegro by land, air, or sea. We have listed extensive route and travel information below which you can make a note of, or alternatively, click to download the relevant PDF at the bottom of this page. You can get here by car from the Montenegrin coast (heading inland from Risan, Budva or Bar), via the capital city of Podgorica or by arriving from one of our neighboring countries. Which ever way you plan to arrive please see which of the routes below you will link up, all of which provide directions from regional towns and cities that you must pass through to get to our camp. This is the quickest and best route from Podgorica to us. Please note: In December 2010, a new road section on the road between Šavnik-Žabljak was opened, which will not be found on maps of Montenegro issued before 2011. This new road has changed the route, it is now 12km shorter and a far better road than the old one. Thus, if you travel to Žabljak via Nikšić, you should not travel via Boan or Mljetičak (right turn on the exit from Šavnik), but instead continue straight, via Petnjica, and through the Ivica Tunel. The road is visibly signposted in Šavnik so you should not worry about losing your way. The journey from Podgorica to Žabljak will take about 2.5h. As you are about to enter the town of Žabljak you will see a blue sign on the right hand side of the road with the name ‘Kamp Razvrsje and Apartmani Razvrsje’ on it. Continue for 20 – 30 meters after the sign and take a sharp left up the small steep asphalt road. Follow this road for 500 or 600 meters. You’ll see another larger red sign for ‘Kamp Razvrsje’ on your left. From this sign carry on straight up the road (please note: we are not the first camp you see on the left, which is called Eko Camp!). After the red sign you will need to continue straight for about 200 meters and until you have reached the end of the small road. At this point you enter the camp by driving directly up the steep road access for cars. You can park on the left and come in to our reception hut or knock on the main house door. Trip suggestion: we suggest, if you have time, if you come to us using this route that you visit the Ostrog Monastery (built in the 17th century), which is located high in the mountains, 10km before Nikšić (you will notice a well signposted crossroads, where you need to take a right turn). The tour will take no less than 30min for getting there and back from the main road and 1h for sightseeing of the monastery itself. The remains of Saint Basil of Ostrog, the most worshiped saint in Montenegro, are kept in the Ostrog Monastery. The road from Podgorica to Žabljak (via Kolašin and Mojkovac) is longer (160km, 3h ride) than Route A, and far busier than the road via Nikšić. However, it takes you through two incredibly beautiful, deep, canyons, whose beauty will, without any doubt, leave you breathless. Between Podgorica and Kolašin, the road passes through “Platije”, the canyon of the Morača River, and the entire length of the road from Mojkovac to Žabljak runs parallel with the Tara River canyon, the deepest canyon in Europe. The Morača Monastery, built in 1252, dedicated to the Ascension of Madonna, is definitely worth a visit. It is 50km from Podgorica, and clearly signposted on the right. Our advice to you is that, if arriving by car, you take one route for arrival and the other for departure, to enjoy both Route A and Route B landscapes. When coming from Podgorica using this route, on approaching Mojkovac, you should pay attention to the crossroads at the very entrance to the town (before the bridge) and turn left towards Žabljak. Once you reach the Tara Bridge you will need to take a left (instead of turning right which would take you over the bridge) which is signed to Žabljak. This is a steep and winding road that will take you up the side of the canyon and into Žabljak (about 23 KM away). Continue into the center of Žabljak and you will arrive at ‘T’ junction (on your left you will see a small car park and a hotel called ‘Hotel Žabljak’). At the ‘T’ junction take a left and follow the road out of Žabljak town. You will pass a small petrol station and bus station on your right after about 1km. Keep going straight along the road, which joins another larger road after about 500 meters (keep to the right) and follow that road out of the town (you will notice forest trees on your left and right). After 500 meters you will see a yellow sign for ‘Razversje’, take this small asphalt road. After about 500 or 600 meters you’ll see red sign for ‘Kamp Razvrsje’ on your left. From this sign carry on straight up the road (please note: we are not the first camp you see on the left, which is called Eko Camp!). After the red sign you will need to continue stright for about 200 meters and until you have reached the end of the small road. At this point you enter the camp by driving directly up the steep road access for cars. You can park on the left and come in to our reception hut or knock on the main house door. If you come by this route the distance is 60km (a 1h ride) once you reach the town of Pljevlja (in Montenegro), from Prijepolje, in Serbia. You will take the road from Pljevlja, which passes by the huge powerplant and via the villages of Odžak and Kosanica before you will reach the Tara bridge (after 37 km). After crossing over the Tara Bridge carry straight on up the other side of the canyon (signed to Žabljak). This is a steep and winding road that will take you up the side of the canyon and into Žabljak (about 23 KM away). Continue into the center of Žabljak and you will arrive at ‘T’ junction (on your left you will see a small car park and a hotel called ‘Hotel Žabljak’). At the ‘T’ junction take a left and follow the road out of Žabljak town. You will pass a small petrol station and bus station on your right after about 1km. Keep going straight along the road, which joins another larger road after about 500 meters (keep to the right) and follow that road out of the town (you will notice forest trees on your left and right). After 500 meters you will see a yellow sign for ‘Razversje’, take this small asphalt road. After about 500 or 600 meters you’ll see red sign for ‘Kamp Razvrsje’ on your left. From this sign carry on straight up the road (please note: we are not the first camp you see on the left, which is called Eko Camp!). After the red sign you will need to continue straight for about 200 meters and until you have reached the end of the small road. At this point you enter the camp by driving directly up the steep road access for cars. You can park on the left and come in to our reception hut or knock on the main house door. If you travel from Bosnia, Sarajevo, or another city from central or northern Bosnia and you would like to “avoid” main roads and get to know this region, you can get here in the following way: the closest border crossing to Bosnia is the one at Šćepan Polje, from which you can get to Žabljak via the town of Plužine, or, via the village of Mala Crna Gora. One option is the route Šćepan Polje- Plužine -Žabljak. The distance from Šćepan Polje to Plužine is 25km. From Plužine to Žabljak you can arrive by the Magistral road, which takes you through the settlement Jasenovo Polje and Šavnik. The overall distance of this route is 98km. There is another road from Plužine via Trsa and Pisče (54km). It is asphalted, though not as wide as the road via Šavnik. On the other hand, it is not a busy road, it is very picturesque, and takes you through an extremely beautiful landscape. If you opt for this route, you will get to see Durmitor from its western side, so you will see a more complete image of this mountain (which is different depending on whether it is observed from its eastern or its western side). However, please note: if you plan on visiting Durmitor before June, or even at the beginning of June, you should by all means inquire if the road from Plužine to Trsa and Pišče is cleared of snow, since snow drifts are common even in late spring. Coming from either of these routes; as you enter the town of Zabljak you will see a blue sign on the right hand side of the road with the name ‘Kamp Razvrsje and Apartmani Razvrsje’ on it. Continue for 20 – 30 meters after the sign and take a sharp left up the small steep asphalt road. Follow this road for 500 or 600 meters. You’ll see another larger red sign for ‘Kamp Razvrsje’ on your left. From this sign carry on straight up the road (please note: we are not the first camp you see on the left, which is called Eko Camp!). After the red sign you will need to continue straight for about 200 meters and until you have reached the end of the small road. At this point you enter the camp by driving directly up the steep road access for cars. You can park on the left and come in to our reception hut or knock on the main house door. The distance between Dubrovnik and Žabljak is 150km by road via Trebinje,Vilusi, Nikšić and Šavnik. On this route you cross two borders, Croatian-Bosnian and Bosnian-Montenegrin. Crowds and queues on border crossings are rare. Coming in on this route; as you enter the town of Zabljak you will see a blue sign on the right hand side of the road with the name ‘Kamp Razvrsje and Apartmani Razvrsje’ on it. Continue for 20 – 30 meters after the sign and take a sharp left up the small steep asphalt road. Follow this road for 500 or 600 meters. You’ll see another larger red sign for ‘Kamp Razvrsje’ on your left. From this sign carry on straight up the road (please note: we are not the first camp you see on the left, which is called Eko Camp!). After the red sign you will need to continue straight for about 200 meters and until you have reached the end of the small road. At this point you enter the camp by driving directly up the steep road access for cars. You can park on the left and come in to our reception hut or knock on the main house door. With public buses, you can get here from the coast as well as from neighbouring countries. The bus lines between Podgorica-Nikšić-Žabljak work several times a day. You can also get buses from Bosnia (Sarajevo / Mostar – Nikšić – Šavnik- Žabljak) or from Serbia (Belgrade – Prijepolje – Pljevlja – Žabljak). Žabljak is only 390km away from Belgrade, 230km from Sarajevo, and about 150km from Dubrovnik. 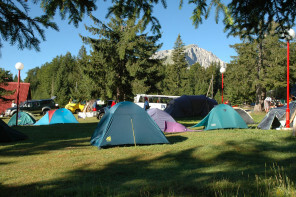 Our camp is located 1km from the bus station and we can arrange pickups or a taxi for you. Guests can call us from the bus station and in most cases we can pick them up and transfer them to our camp free of charge. Buses from Budva / Podgorica to Žabljak go via Nikšić (and take about about 2.5 to 3hrs from Podgorica). There are three direct lines daily from Podgorica to Žabljak. In Podgorica, if you use the “indirect” line, you will have to change bus (you will be informed by the conductor when/where to change). Between Nikšić and Žabljak there are several bus lines, so it makes no difference if you take the direct line from podgorica, or take any bus from that station that is bound for Žabljak. There are two daily departures from Belgrade bound for Žabljak, a morning and an evening one. Besides these two buses, there are also many lines from Belgrade to Pljevlja, where you can get an onward connecting bus to Žabljak . The last bus from Pljevlja to Žabljak leaves at 3.30pm, so if you arrive in Pljevlja later than that, you will either have to take a taxi to Žabljak (30e) or spend the night in Pljevlja. As there is no direct line from Sarajevo to Žabljak, you have to change in Pljevlja. In this case, you should bear in mind that after 3.30pm there is no bus from Pljevlja to Žabljak. You can also take a route via Nikšić and then on to Žabljak. There are no direct bus lines from Dubrovnik to Žabljak, so in this case you would have to reach Podgorica (via Herceg Novi), or Nikšić (via Trebinje and Vilusi, or via Herceg Novi, Trebinje, Risan and Vilusi) and then take a connecting bus on to Žabljak. We consider this option to be too exhaustive and we would not recommend it to anyone, except to young people who do not mind changing buses and waiting around. It is possible to fly directly into Montenegro to either Podgorica International Airport (approximately 170km distance / 2.5 hrs driving) or Tivat International Airport (approximately 250 km distance / 3.5 hrs driving). Alternatively it is possible to fly to Cilipi Airport just outside Dubrovnik in the Croatian Republic (170km away from Žabljak via Bosnia and Herzegovina). You can obtain the information on direct flights to Montenegro at www.montenegroairlines.com and www.jat.com (Serbian aircarrier) as well as checking carries that fly into Dubrovnik (such as EasyJet). 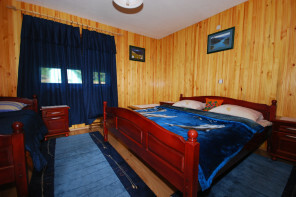 Guests care able to get a train connection to Mojkovac and then a connecting taxi to Žabljak, which takes between 1 and 1.5 hrs of driving time. Taxis cost between 30 and 40 Euro depending on the time of year. The train line runs between Belgrade (Serbia) and Bar (Montenegro) and Mojkovac is about 3.5 hrs from Bar. Generally, we do not recommend this option for two reasons: firstly, the trains are usually considerably delayed and secondly, there is no direct bus line from Mojkovac to Žabljak. 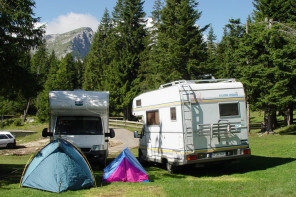 Our camp and apartments are located close to the city center of Žabljak . From the center, head out of Žabljak (in the direction of Šavnik/Nikšić) and you will pass the petrol station and bus station (after about 400 meters). A few hundred meters after passing the bus station the road joins another larger road (keep to the right) and follow that road out of the town. After 500 meters you will see a yellow sign for ‘Razversje’, take this small asphalt road which leads up to the right. After another 500 or meters you’ll see a red sign for ‘Kamp Razvrsje’ on your left. From this sign carry on straight up the road (please note: we are not the first camp you see on the left, which is called Eko Camp!). From the red sign you will need to continue straight for about 200 meters until you have reached the end of the small road. At this point you enter the camp by driving / walking directly up the steep access lane (you’ll see red houses on your right). You can park on the left and come in to our reception hut or knock on the main house door.